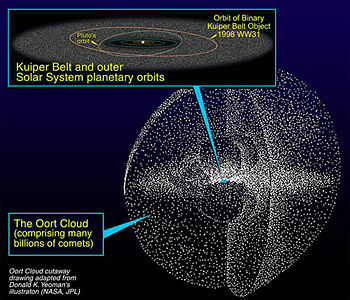 Artist's rendering of the Kuiper Belt and hypothetical more distant Oort cloud. The Kuiper belt (pronounced /ˈkaɪpɚ/, rhymes with "viper") is a zone of the solar system extending from the orbit of Neptune (at 30 astronomical units (AU) to 50 AU from the Sun. The objects within the Kuiper belt, together with the members of the scattered disk extending beyond, are collectively referred to as trans-Neptunian, along with any hypothetical Hills cloud and Oort cloud objects. Together with the asteroid belt which is the source of meteorites, Kuiper belt objects give important clues to the distribution of materials and evolution history of the Solar System through their orbital characteristics and compositions. Kuiper belt objects coming as comets and dusts are gift for humanity to go back in time and study the early stage of the Solar System. 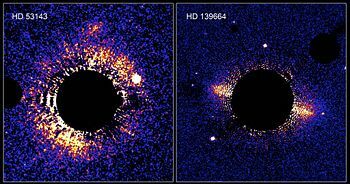 The debris disks around these two remote stars seem equivalent of our own Solar system's Kuiper Belt. The left image is a "top view," and the right image is an "edge view." The black central circle is produced by the camera's coronagraph which hides the central star to allow the much fainter disks to be seen. Observed with Hubble Space Telescope. Modern computer simulations show the Kuiper belt to have been strongly influenced by Jupiter and Neptune. During the early period of the Solar System, Neptune's orbit is thought to have migrated outwards from the Sun due to interactions with minor bodies. In the process, Neptune swept up, or gravitationally ejected all the bodies closer to the Sun than about 40 AU (the inner edge of the region occupied by cubewanos, objects in the main Kuiper belt), apart from those which fortuitously were in a 2:3 orbital resonance. These resonant bodies formed the plutinos. The present Kuiper Belt members are thought to have largely formed in their present position, although a significant fraction may have originated in the vicinity of Jupiter and been ejected by it to the far regions of the Solar system. The first astronomers to suggest the existence of this belt were Frederick C. Leonard in 1930, and Kenneth E. Edgeworth in 1943. In 1951, Gerard Kuiper suggested that the belt was the source of short period comets (those having an orbital period of less than 200 years). More detailed conjectures about objects in the belt were done by Al G. W. Cameron in 1962, Fred L. Whipple in 1964, and Julio Fernandez in 1980. The belt and the objects in it were named after Kuiper following the discovery of (15760) 1992 QB1. An alternative name, Edgeworth-Kuiper belt is used to credit Edgeworth. The term Trans-Neptunian Object (TNO) is recommended for objects in the belt by several scientific groups because the term is less controversial than all others—it is not a synonym though, as TNOs include all objects orbiting the Sun at the outer edge of the solar system, not just those in the Kuiper belt. Over 800 Kuiper Belt Objects (KBOs) (a subset of trans-Neptunian objects) have been discovered in the belt, almost all of them since 1992. This was primarily a result of advances in computer hardware/software and CCD of high quantum efficiency, allowing for cost effective automated KBO searching in combination with large telescopes. Among the largest are Pluto and Charon, but since the year 2000, other large objects that approached and even exceeded their size were identified. 50000 Quaoar, discovered in 2002, which is a KBO, is half the size of Pluto and is larger than the largest body in the asteroid belt, Ceres. (136472) 2005 FY9 (nicknamed "Easterbunny") and (136108) 2003 EL61 (nicknamed "Santa"), both announced on July 29, 2005, are larger still. Other objects, such as 28978 Ixion (discovered in 2001) and 20000 Varuna (discovered in 2000) while smaller than Quaoar, are nonetheless quite sizable. The exact classification of these objects is unclear, since they are probably fairly different from the objects of the asteroid belt. The largest recent discovery was Eris, which is actually larger than Pluto. This led scientists to question the definition of the term planet, as it is larger than Pluto and was often called a tenth planet by some sources. Due to this discovery, on August 24, 2006, the IAU announced a first-ever definition of "planet," and these large Kuiper belt objects accordingly became known officially as dwarf planets. A number of astronomers around the world came out in public disagreement with the definition in the days following it. Neptune's moon Triton is commonly thought to be a captured KBO. Orbit classification (schematic of semi-major axes). Orbital resonance with Neptune is the major factor of the current classification of KBO, even if most of them (more than 600 objects as of October 2005) are not resonant. These objects, called Classical Kuiper Belt objects or cubewanos, are found between the 2:3 resonance (at ~39.4 AU, populated by more than 150 plutinos) and the 1:2 resonance (at ~47.7 AU, populated by a few twotinos). Minor resonances exist at 3:4, 3:5, 4:7 and 2:5 (this last, also fairly strongly occupied). The 1:2 resonance appears to be an edge. It is not clear whether it is actually the outer edge of the Classical Belt or just the beginning of a gap. Large cubewanos, plutinos and near scattered objects. 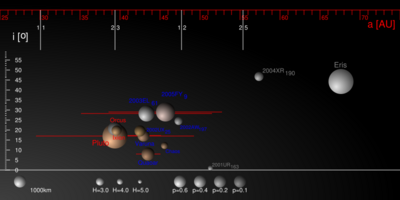 The next diagram shows the largest objects of the Kuiper belt: Pluto with the largest plutinos: 90482 Orcus and 28978 Ixion, a few big classical objects, and two scattered objects (beyond the 1:2 resonance, in grey), notably Eris thought to be the biggest trans-Neptunian object known. The eccentricity of the orbits is represented by the red segments (extending from perihelion to aphelion) with inclination represented on Y axis. While eccentric orbits of many resonant KBOs bring them inside Neptune's orbit periodically, classical KBOs are in more circular orbits (short red segments, Quaoar). Initially, the Kuiper belt was thought to be a flat belt (populated by objects on moderately eccentric, low-inclination orbits), as opposed to high inclination orbits of the "scattered" disk objects. With the discovery of the large cubewanos, this belt became a thick disk or torus. It now appears that the distribution of orbit inclinations peaks around 4 and 30-40 degrees, giving rise to a division into two groups: Cold and hot, respectively. The cold group would have been born outside the Neptune's orbit while the hot migrated outwards due to close interactions with Neptune. The cold/hot terminology comes from analogy to particles in a gas, where, as temperature rises, so do the relative velocities between the particles. This grouping may yet be revised, however, as the current distribution of known objects is likely to be strongly affected by observational bias. Most observations have so far focused on near-ecliptic objects. Even objects with high inclinations (for example, 2004 XR190) were actually found at near ecliptic positions. In addition, most of the known KBOs are detected near their closest approaches to the Sun since they appear dimmer at greater distances. Distribution of cubewanos, plutinos and near scattered objects. The last diagram shows the distribution of known Kuiper Belt objects. The resonant objects: Neptune Trojans (1:1 resonance), plutinos (2:3), twotinos (1:2) and a handful of objects occupying other resonances are shown in red. Confirmed plutinos are plotted in dark red. 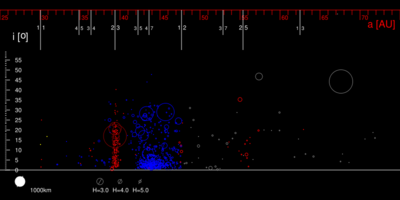 Beyond the 1:2 resonance, scattered disk objects are plotted for reference. Interestingly, low inclination regions which include the "cold" majority of cubewanos appear devoid of the largest objects (see diagram). The (observed) distribution has been a challenge to the theories of the formation of the Kuiper belt as it is far too complex to be explained simply as being the remains of the original accretion disc dating back to the formation of the Solar System. Numerous competing models are being developed, typically involving so-called Neptune migration. It was suggested in the 1980s that interaction between giant planets and a massive disk of small particles would not only scatter the disk but also cause (via momentum transfer) the giants to migrate to more distant orbits. While all four giant planets would be affected, Neptune could have migrated as far as 5AU outwards to reach its current position at around 30 AU. Such models can explain for example, the ‘trapping’ of small bodies into the plutino 2:3 resonances. However, the present models still fail to account for many of the characteristics of the distribution and, quoting one of the scientific articles, the problems "continue to challenge analytical techniques and the fastest numerical modeling hardware and software." The belt should not be confused with the hypothesized Oort cloud, which is far more distant. Illustration of the power law. Bright objects are rare compared with the dominant dim population, as expected from accretion models of origin, given that only some objects of a given size would have grown further. This relationship N(D), the population expressed as a function of the diameter, referred to as brightness slope, has been confirmed by observations. 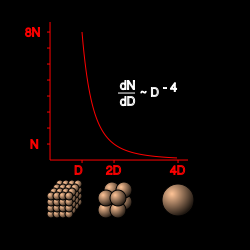 The slope is inversely proportional to some power of the diameter D.
The total mass of Kuiper Belt objects can be inferred by models of the origin of the Solar System from the known mass of the planets and known distribution of mass closer to the Sun. While the estimates are model-dependent, the total mass of around 30 MEarth is expected. Surprisingly, the actual distribution appears to be well below that value, even accounting for the observational bias. The observed density is at least 100 times smaller than the model calls for. This missing 99 percent of the mass can be hardly dismissed as it is required for the accretion of bigger (greater than 100 km) objects ever taking place. At the current low density, these objects simply could not be created. Moreover, the eccentricity and inclination of current orbits make the encounters quite "violent," resulting in destruction rather than accretion. It appears that either the current residents of the Kuiper belt have been created closer to the Sun or some mechanism dispersed the original mass. Neptune’s influence is too weak to explain such a massive "vacuuming." While the question remains open, the conjectures vary from a passing star scenario to grinding of smaller objects, via collisions, into dust small enough to be affected by Solar radiation. Earlier models of the Kuiper belt had suggested that the number of large objects would increase by a factor of two beyond 50 AU; however, observation has revealed that in fact, at 50 AU, the number of observed objects in the Kuiper belt falls precipitously. This falloff is known as the "Kuiper cliff," and its cause is unknown, though Alan Stern of the Southwest Research Institute has claimed that a large planetary object might be responsible. Bernstein and Trilling et al. have found evidence that the observed rapid decline in objects of 100 km or more in radius beyond 50 AU is a real decline in the number of objects, and not just an observational effect. Most models of solar system formation show icy planetoids first forming in the Kuiper belt, while later gravitational interactions displace some of them outwards into the so-named scattered disc. Strictly speaking, a KBO is any object that orbits exclusively within the defined Kuiper belt region regardless of origin or composition. However, in some scientific circles the term has become synonymous with any icy planetoid native to the outer solar system believed to have been part of that initial class, even if its orbit during the bulk of solar system history has been beyond the Kuiper belt (such as in the scattered disk region). Discoverer Michael E. Brown, for instance, has referred to Eris as a KBO, despite it having a semi-major axis of 67 AU, well clear of the Kuiper cliff. Other leading trans-Neptunian researchers have been more cautious in applying the KBO label to objects clearly outside the belt in the current epoch. ↑ Hubble Telescope, Hubble Finds 'Tenth Planet' is Slightly Larger than Pluto. Retrieved April 27, 2007. ↑ Renu Malhotra, Nonlinear Resonances in the Solar System. Retrieved April 30, 2007. ↑ G.M. Bernstein, D.E. Trilling, R.L. Allen, K.E. Brown, M. Holman, and R. Malhotra, The size distribution of transneptunian bodies, The Astronomical Journal, 128, 1364-1390. ↑ D. Jewitt and A. Delsanti, The Solar System Beyond The Planets. Retrieved May 2, 2007. ↑ A. Morbidelli, Origin and dynamical evolution of comets and their reservoirs (Preprint on arXiv). Retrieved May 2, 2007. ↑ M. Brooks, 13 things that do not make sense. Retrieved May 2, 2007. ↑ Bernstein, G.M., Trilling, D.E., Allen, R.L., Brown, M.E., Holman, M., and Malhotra, R. (2004). The Size Distribution of Trans-Neptunian Bodies. The Astrophysical Journal. Retrieved May 2, 2007. The Kuiper Belt. Views of the Solar System by Calvin J. Hamilton. The Kuiper Belt Electronic Newsletter. Plot of the Outer Solar System. Minor Planet Center. Diagram showing the Kuiper belt and Oort cloud to scale with our planetary system. nature.com. Discovery Hints at a Quadrillion Space Rocks Beyond Neptune. Space.com. See also Triton, astronomical objects and the solar system's list of objects, sorted by radius or mass. For pronunciation, see: Centaur and TNO pronunciation. This page was last modified on 25 April 2018, at 14:59.